by © David Gasserwww.playwithtraffic.com Thank you for reading my post, remember this is just my opinion and I think everyone is welcome to have their own. Hope you found the article interesting. Social networking is about much more than branding yourself and getting your name out there. It is a social network of people, which is something that many companies and business owners forget. In today’s ever more competitive online world, simply posted daily and following the eighty/twenty rule is not enough and you may notice less and fewer likes, comments, shares, leads and sales. Social media runs on the engagement of people and businesses alike. For this reason, it is important to let your customers and followers know that there are people at your company, not just robots that randomly post, like, share and comment on things. Make yourself or representatives of your company available as much as possible. If you have a social media team, even better, work in shifts to keep up to date on with your pages. Over the past three years, the internet has moved from one that is text-based to one that is mostly visually based, this is especially true when it comes to social media websites. People are inundated with hundreds, maybe thousands of posts in their news feed or stream every day, they do not have much time to read long articles. So, memes, videos and other forms of visual media have become the grand ruler of these websites. Create short videos, vines, customs memes, and other visually based posts. This will entice users to click, them, especially if they involve a bit of mystery. You also want to let your audience know that you are human. Post videos of your office and colleagues. In addition to letting people know you are a real person, it also gives credibility to your company and brand. Do interviews that spotlight your company and give people more information; this can be especially true for small or new businesses that haven’t really branded themselves or their name yet. When you come up with a plan for posting, whether that is for the day, week or month, give some serious thought to what your followers what to hear, as well as the message you are trying to convey cleverly to them. Social media are a two-way street, if you post something someone does not like, they are very likely to not only to stop following but to block future posts. That is not to say everything you post has to be neutral and positive, but 98% of it should be. Avoid making every post about your company. Make sure you post interesting links or information about your particular niche. Going back to hemp jewelry, if you create and sell hemp jewelry, you obviously don’t want to post links to your competitor's pages. However, you can post articles and videos as well as share pages about jewelry making, history of the art, and other relevant topics. This particular niche would allow you to come up with some pretty interesting meme’s of your own as well. If you have a small fan base on your social media sites, then you might want to make your circle a little bigger. An excellent way to do this is to +1, follow, or favorite users who take the time to share your content with others. This can be exceedingly helpful when you are monitoring who is looking at your posts and who likes them. Especially on Twitter, where you can monitor your username, and it shows all posts where you have been mentioned. If you do not have twitter, try using a search engine and querying your username, URL, or company name. When it comes to facebook and Google, the guidelines and rules change quite often and can be hard to keep up with. For this reason, you want to make sure you check out recent changes to these items as it could have a significant impact on your page. The big mystery behind gaining new followers and keeping old ones is not that complicated to figure out. It also does not take a big chunk of time out of your day. The most important rule is to post, stay up to date on the latest trends, and stay in touch with your users. They are people just like you who are looking to connect with businesses much in the same way they do with their friends and family. Just a few extra clicks and you should be on your way to a huge fan base and as much exposure as you can handle. Guy Kawasaki, the legendary former chief evangelist for Apple and one of the pioneers of business blogging, tweeting, Facebooking, Tumbling, and much, much more. 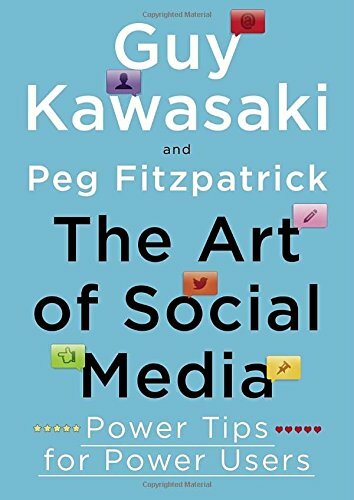 Now Guy has teamed up with Peg Fitzpatrick, who he says is the best social-media person he's ever met, to offer The Art of Social Media-the one essential guide you need to get the most bang for your time, effort, and money. A must have for online marketers interested in leveraging the power of social media!